Today was Day #2 of our "spring" break. I typed quotes around the word "spring" because if you were to look out my window right now you would think it was January 1st. The pile of ice in our yard is almost as tall as I am. I'm not kidding. Just as the rest of my fellow Minnesotans are doing, I am continuing to remain patient. Spring will come! Spring will come! I went from writing a post a day in early December to a post a week here in early January. I have been working on a big project that is food-related and that I am very excited about. I will be ready to unveil it in a few weeks! Wooo! In fact, this post provides a giant clue about what my secret project is. Any guesses? 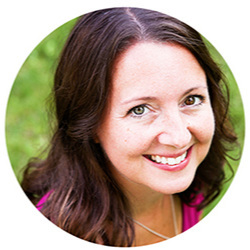 Thanks again for all of the wonderful comments and emails regarding my website. I will not ignore a single one! My boys and I are enjoying a lazy Saturday, so I will share this recipe with you and get back to relaxing on the couch. 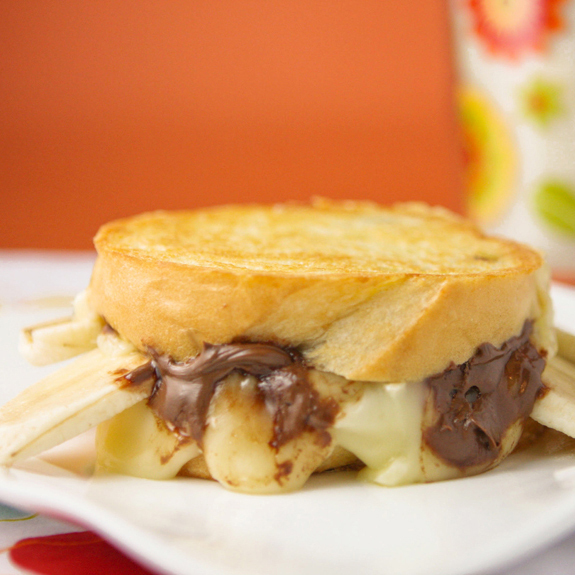 Important business calls..
Nutella, bananas and brie cheese are packed inside the walls of this grilled cheese sandwich! Place the bread slices on a flat work surface. Spread 1 tablespoon of butter evenly over one side of each slice of bread. Flip the buttered bread slices over and spread 1 tablespoon of Nutella over each. Warm a skillet over medium heat for 3 to 5 minutes. Layer each sandwich as follows: Slice of bread, butter side down, Nutella side up, 1/4 of the Brie cheese slices, 2 banana slices, 1/4 of the Brie cheese slices and slice of bread, Nutella side down, butter side up. Place sandwiches onto the hot skillet. Cook on each side for about 3 to 4 minutes, or until the bottom layer of cheese begins to melt around the edges. Cut in half and serve! Something simple, yet gooey and tasty! Be prepared to say CHEEEEEEEEEESE!!! One morning a few weeks ago I was sitting at my desk at work wishing I had something to eat. My stomach was groaning and rumbling, so every couple minutes I would open my drawer in hopes that something edible would magically appear. Magic did not occur that morning, so I began dreaming up a delicious sandwich. I wanted cheese, lots of cheese, and veggies. Something simple, yet gooey and tasty. This is the sandwich I came up with. I knew we had all of the ingredients at home, so I sped home, made it, photographed it, ate it, and sped back to work, tummy very happy. Be prepared for CHEESE! Yum. If you love Grilled Cheese Sandwiches as much as I do, I encourage you to check out my Reuben Grilled Cheese. It has changed the grilled cheese sandwich for me forever! MIND BLOWN! Place the bread slices on a flat work surface. Spread 1 Tablespoon of butter evenly over one side of each slice of bread. Warm a skillet over medium heat for 3 to 5 minutes. 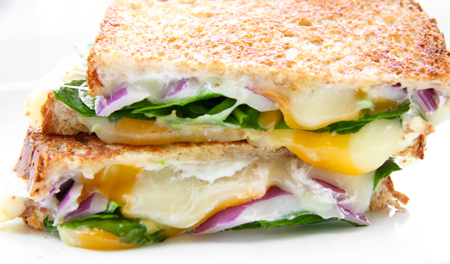 Layer the sandwich as follows: slice of bread, butter side down, 1 slice provolone, 1 slice cheddar, spinach, red onion slices, 1 slice provolone, 1 slice cheddar and remaining slice of bread, butter side up. Place sandwich onto the hot skillet. Cook on each side for about 3 to 4 minutes, or until the bottom layer of cheese begins to melt around the edges. Cut in half and serve!